An updated version of my very first random map script. This script generates a random map that has been flooded with large areas of shallow water (sort of like salt marsh but with more shallows and lots of extra food). My original intention was to create a map where ships and land units could fight each other in the shallows, but I realized that it is easy to play this map without ever building ships, because you can just walk across the shallows. I attempted to encourage shipbuilding by adding deep patches as "safe zones" for ships and providing a large amount of fish. Standard starting resources for each player. Additional resources on other islands including dedicated bonus gold and stone islands guarded by wolves. Lots of fish for extra food. Check the Steam Workshop for more screenshots. Played this map several times now and have to say that it's a pretty good one. The mix of navy and army is pretty good, the blue lakes in the shallows make the fighting even more interesting. 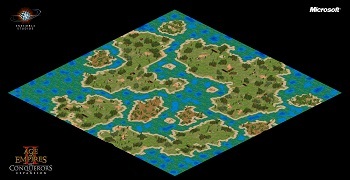 The islands with additional ressources offer new battlefields, especially in the later game, when ressources become scarce. There is enough wood to support a large navy, the amount of gold, stone and food seems to be like on every ES-Map, only thing is that there is to much fish imo. The Marlins jumping through sand are not really an issue, walling from land units is fairly easy (at least on the variants of the map I've played on), but by walling one looses the control of the water and that's game over on this map, so it's a really offensive and fun to play map. All in all, pretty good! As I enjoyed playing this map so much, I would like to ask you if I can this map in my expansion and if you would be interested in making even more maps for my expansion. You would be fully credited of course. It's great that you enjoyed my map. I will see if I can come up with some more good maps.